Houston, as a city, is the largest legal market in Texas. With approximately four million people in the Houston metropolitan area, this is no surprise. As the largest seaport in the United States, an energy hub, a transportation center, and home for several major offices of financial institutions and insurance companies, Houston has the most diversified economy in Texas and, consequently, some of the broadest variety in the types of legal work available. The firms we work with in Houston range from small firms, with five to ten attorneys, to the major firms in town, with attorney headcounts of 500 or more. The larger ones in Houston are typically full-service firms. Some of the smaller firms we service are litigation boutiques with unique niche practices, such as pure trial practices, immigration boutiques, and personal injury work for plaintiffs injured overseas. Most of the important firms in Houston have offices downtown. Downtown offices afford attorneys the opportunity to be close to court and their peers and typically provide the most convenient attorney lifestyle. 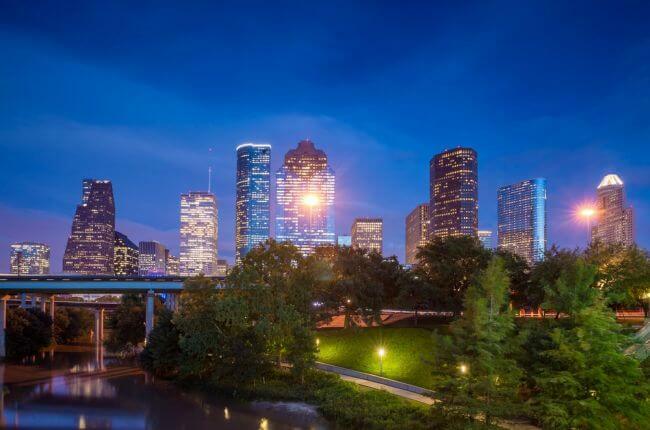 While there are strong firms that have chosen offices in the Galleria area, about 15 minutes west of downtown Houston, these firms are certainly in the minority and typically are niche-practice or middle-market firms. Convenient location was probably the overriding concern when office space was chosen by these smaller firms because rents and quality of office space are not appreciably different in either area. The Woodlands is a planned community approximately 30 miles northwest of Houston. There are several important energy companies that have set up offices in this subdivision because of its convenience for employees, land prices, and beauty. Following this trend, some law firms with downtown offices have also chosen to open outpost offices in the Woodlands. Houston is the only city of its size in the United States without significant zoning restrictions. What does this mean for an attorney considering a move to Houston? If you are not careful about where you live, you might find your expensive house bordering on the yard of a tune-up shop. That whirring noise in the back of your yard might turn out to be the exhaust fan from a popular Chinese restaurant that will leave a lingering scent of fried pork around your house on the stifling, still evenings of summer. A good realtor can avoid these problems, and there is an elaborate system of deed restrictions that help to make the nice neighborhoods some of the nicest in this country. The economic freedom that the lack of zoning restrictions creates has kept Houston very vibrant and has also kept housing prices relatively low. An attorney we placed in Houston was able to sell his three-bedroom house on the East Coast-45 minutes by train from Manhattan-and purchase a three-bedroom, two-bath townhouse 10 minutes from work in downtown Houston for slightly more than half the sale price of his New Jersey home. He reports that, from his house, he has no fewer than eight restaurant options, a grocery store, and a tennis club fewer than five minutes away by foot. From a work standpoint, what the lack of zoning does is create a shortage of positions for real estate attorneys specializing in land use, because the restrictions simply are not there. Leasing attorneys and corporate attorneys with REIT experience, on the other hand, are often in high demand. We work closely with one attorney at a firm in Houston who actually invented the modern REIT structure. Recently, important practice areas for lateral hiring in Houston have been bankruptcy and litigation. We have seen a reduction in bankruptcy attorney hiring lately, but litigation hiring continues. The response to the weak legal market of the past two years has been that the firms have sought only the strongest candidates and have not been willing to consider even litigation candidates with weak academics. We currently still have openings for associate litigation attorneys ranging from very junior to mid level, and these openings are with both large and small law firms. Corporate and securities attorneys are being considered in Houston by several firms. Many corporate partners in Houston expect this year to be very strong for corporate attorneys specializing in securities assurances. Many of Houston's strongest public companies have not gone to the public markets in some time, and there is a great deal of pent-up demand. According to one investment bank representative in Houston, "There have not been this many deals ready to go in Houston in three years." Discussion of the corporate openings currently in Houston affords the opportunity to discuss the contrasts in the hiring preferences of Houston firms. One firm wants to find an associate with energy company experience and insists the candidate come from a Houston firm. They reason is that the attorney needs to know the energy community and the processes of energy companies and could not possibly have received the same experience elsewhere. Another firm wants an associate of similar experience level, but insists that the associate come from another city. The reasoning of this firm, which we frankly find more sound, is that someone relocating to Houston is less likely to be fleeing from a position at his/her current firm that was unsatisfactory. We see this disparity often in Texas. Some firms are open to people coming without the Texas bar and with moving expenses and bar study delay attached, while others insist that knowledge of judges, business leaders, and marketplace is paramount. In both cases, exceptions are made from time to time.